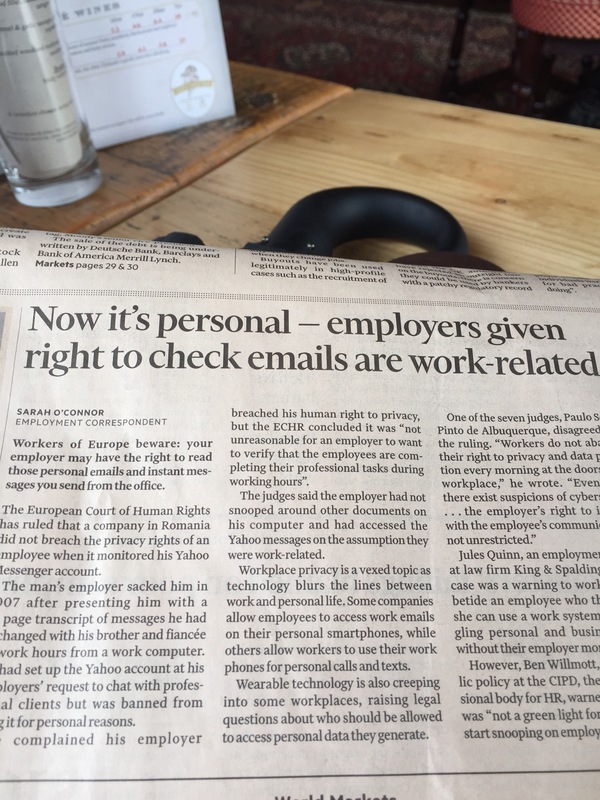 ….worms when he said: “Workers do not abandon their right to privacy and data protection every morning at the doors of the workplace….the employers right to interfere with the employee’s communications is not unrestricted.” The other six judges disagreed with him. I can see why. Why would you give someone a computer and pay for their time to work on your business only to find they are using your money for their own private purposes. Nevertheless, the memorably named dissenting judge – Paulo Sergio Pinto de Albuquerque – prompts me to ask a question: are employees human resources or capital assets whose entire being the corporation owns, once they clock in? I think not. I believe the opposite: employees are small career businesses. Jobs are joint ventures. Organisations are coalitions of these JVs for short periods. The ruling may be technically correct but businesses should be careful. No one really believes in the human capital asset conceit. I once asked a seminar full of HRDs, many of them from FTSE companies, to “up hands” if they loved being human capital assets. No hands. So, if organisations continue to treat employees as if they own them, when they don’t and can’t, they shouldn’t be surprised that they don’t get the value they could be getting from them if they treated each one as the unique, small career business, joint venture contributor they are and can be. Posted on January 14, 2016 by Ciaran Fenton. Bookmark the permalink.